I've been meaning to put this post together for a while now but for some reason it just hasn't happened......until now! Last week one of my friends messaged me and asked if I had done a blog post on subscription boxes and part of me wasn't sure if I had or not. I think I was surprised that I actually hadn't done one but I remembered that I did give them a little mention in my 30 Things That Make Me Happy post from a little while back. Lucky Dip Club is by far my favourite find of this year, and possibly ever! I think I came across them by a random Instagram photo and I instantly fell in love with what was on offer. This box gets me really excited and it's amazing to see how many more subscribers it gets every month as it grows in popularity and as word is getting out about it. For £15 a month I receive a handmade and personalised box of surprise goodies and I am officially part of the Lucky Dip Club. I think this month they've put the price up to £18 a month but the lucky early subscribers like me still get it for the lower price. Yay! With a different theme every month each box completely differs from the next but they each generally contain an original one of a kind stationery item, a collectable jewellery charm of the month, an item which is personalised with your name, a DIY piece along with the monthly zine / newsletter. Lucky Dip Club collaborates with different illustrators and designers to bring you the quirkiest and most adorable accessories you'll ever see. I absolutely adore the Lucky Dip Club and all of the cute accessories they send me every month. I feel like they have really brightened up my life and my home! Aside from that I love the element of surprise and not knowing what's going to be inside the box. I have never been disappointed so for me this is a worthwhile spend every month and something I would hate not to be a part of now. 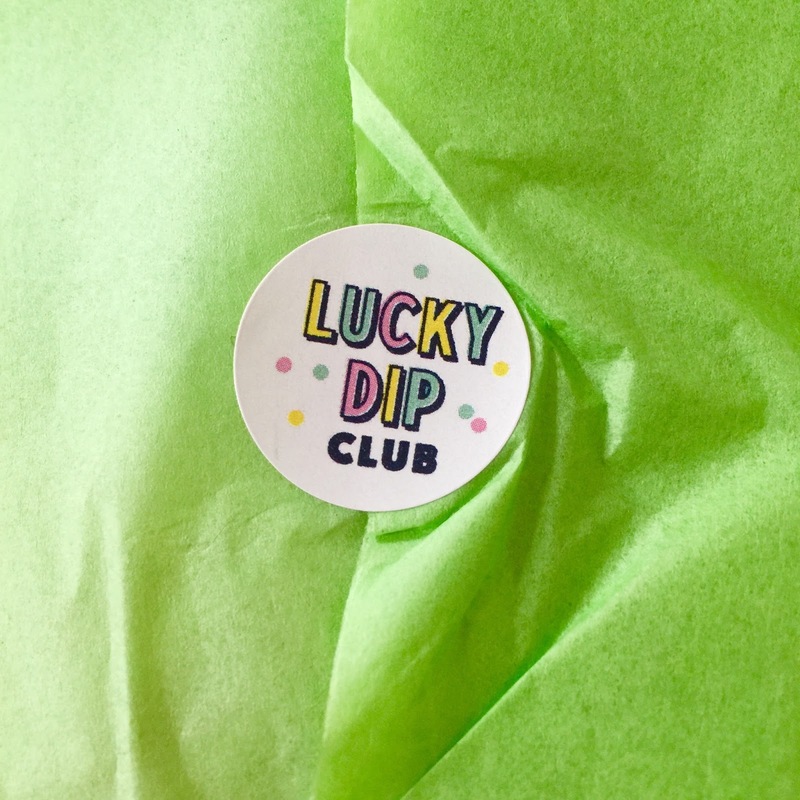 Lucky Dip Club has an amazing ability of making you feel as though you are part of a very exclusive little community who collectively share the same passion for all things cute! I love nothing more than searching #LuckyDipClub on Instagram and looking at all the weird and wonderful ways other members utilise their box contents. This month has been particularly special with the crochet jellyfish project and seeing how everyones turned out! I loved making mine and i'm already onto my second and seriously considering crochet as my new 'thing'! Now time to move onto one of my other favourites! If you're a regular follower of my blog you will know that each month I review my TVK lifestyle box which is a regular monthly subscription box which offers up a few tasty edible Vegan items, one homeware or toiletry item and a recipe card in each box. I have been a subscriber to this box since my decision to go Vegan last September and it was the best decision I could have made. I really look forward to my box arriving each month and wondering what will be inside! Sometimes Vegan treats can be hard to come by, particularly if like me you happen to live in a rural out of the way area with few shops, but the Vegan Kind is perfect for stocking me up and introducing me to new brands. I think that for just £10 a month + P&P TVK is a worthwhile and affordable lifestyle box. With 10p form every box sale also going towards a different chosen animal related charity every month, you're also contributing towards a great cause. It did take me a little while longer to sign up to the TVK Beauty Box as I wasn't sure if I could justify anymore expenditure on subscription boxes. However once I realised that it was a quarterly box, and not monthly, it certainly helped to make the decision easier. The Beauty Box is slightly more expensive at £15 + P&P every quarter, however I would have to say that out of all my boxes this one is probably the best value due to the quality and often full sized products received. I would say that from my experience Vegan & Cruelty Free cosmetics and beauty products are much harder to come across than anything else. Now I am almost a year into being Vegan I am much more familiar with the brands and shops that cater for me so I am finding it easier but this makes the TVK Beauty Box even more worthwhile as it's great to be introduced to new brands and existing favourites. Plus I do think that it's only once you've really tried a beauty product and introduced into your routine that you really get a feel for it which is what would ultimately lead you to purchase it again in future. Ok so I don't actually subscribe to the Vegan Tuck Box but it has been on my radar for some time now and ever since my husband bought me their Easter special box in April. It's a box that I wish I was subscribed to but I really am at my limit at the moment! Perhaps at some point I will cancel another box so that I can enjoy this one for a few months instead because they really do offer up a fantastic box of Vegan treats! I really like how the Vegan Tuck Box offers two different box sizes and subscription prices. For £17 a month + P&P you can sign up to their classic size box which contains 10 - 12 different snacks every month. Or you can opt for the smaller box which offers up 5-6 items a month for £8.50 + P&P. You also have the option to buy the boxes individually without signing up for a subscription for £1 more. I hope you've enjoyed this post and if you are not already a subscriber to a monthly box I hope you feel inspired to treat yourself to a special surprise every month! Subscription Boxes have taken off massively over the past year or so and I can totally see why. There really is nothing quite as joyful as receiving a special package every month with your name on and having no idea what could be inside. Maybe you already sign up to a subscription box? What's your favourite? I'd love to hear your comments below and maybe there'll be a couple more I can add to my wish list!